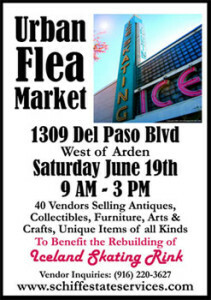 Schiff Estate Services is hosting an Urban Flea Market to benefit the rebuilding of Iceland Skating Rink this Saturday, June 19th from 9am – 3pm. The flea market, set up on the lot adjacent to Schiff Estate Services, features 40 vendors selling antiques, collectibles, furniture, arts & crafts, and other unique items. Visit www.schiffestateservices.com for more information. June 17, 2010 in Fun, Iceland Skating Rink.